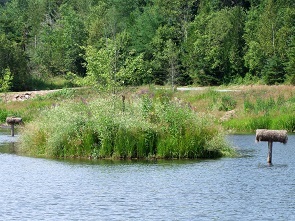 Matthew’s Cove Park (31 Meenan’s Cove Road) located just off the Gondola Point Arterial, provides an excellent opportunity to educate visitors of all ages on the importance of wetlands, and their functioning ecosystems. From the Gondola Point Ferry hiker, walkers, and cyclist can travel on the The Great Trail network that is located through out Matthew Cove Park. When entering Matthews Cove the trail leads through a series of interpretive viewing areas. Visitors get a chance to enjoy the natural beauty of the landscape and its wildlife, while learning about the history and new functionality. The Great Trail stretches though Quispamsis from The Gondola Point Ferry to the Quispamsis/Rothesay boarder on the Vincent Rd. A distance of 5.7km. In 2013, the Matthew’s Cove trail and interpretive viewing area received the Active Living Award of Excellence.